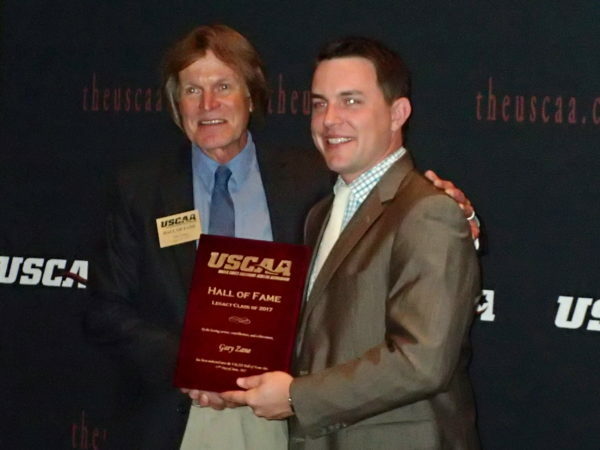 Gary Zane (left) of Unity is presented with a plaque recognizing his induction into the United States Collegiate Athletic Association Legacy Hall of Fame recently in Norfolk, Virginia. Zane spent 30 years as a coach and administrator at Unity College. Gary Zane, who dedicated 30 years of service to Unity College, including a 19-year stint as athletic administrator, was recently inducted into the and United States Collegiate Athletic Association Legacy Hall of Fame. Zane was one of 14 people inducted into the inaugural hall of fame recently at a dinner in Norfolk, Virginia. Zane recorded over 200 victories as head coach of the Unity men’s and women’s soccer teams and 100 more guiding the Rams men’s basketball team. He led his teams to five NSCAA/USCAA national soccer championships and three conference titles. Zane also coached Unity’s club baseball and softball teams, and was instrumental in increasing athletic opportunities for women at the college. Zane, who retired in June 2016, served as the NSCAA’s vice president from 1998-2000 and was also president of the Yankee Small College Conference from 1998-2004. He also served as Unity’s Dean of Students from 2003-2016 and helped oversee Unity’s transition from the USCAA to the National Small College Athletic Association. Peter McDonnell, a native of Ireland, has been added to the coaching staff of the University of Maine women’s soccer team. McDonnell will serve as a volunteer assistant. McDonnell’s coaching career started at age 16, when he ran camps for the youth soccer club which his father and grandfather formed in 1975 in his hometown of Killala in County Mayo. McDonnell came to the United States in 2010 to pursue a sports management and coaching career with Global Premier Soccer in Massachusetts. He worked within the human resources department and was also the director of coaching within southern Massachusetts. McDonnell returned to Ireland in 2012 to undertake a UEFA B coaching diploma and work within The Football Association of Ireland’s Emerging Talent Centers. While there, McDonnell developed U15/U16 international and development international players before returning to the U.S. in 2014. McDonnell most recently coached the John Bapst boys team, leading the Bangor school to a 15-2 record and an appearance in the Class B North title game last fall. He also assisted with the Husson University men’s program last season. McDonnell holds a UEFA license from the Football Association of Ireland and is the director of coaching at Seacoast United Maine in Brewer and is an assistant coach for its NPSL men’s team.